Holly Shaw: What Time Is It? Thanks to Troy, Chad, Gabriella, Ryan, Sharpay, the catchy tune, peppy choreography and masterful Disney marketing, I can't ask what time it is without that song popping into my head, so I had to share. Be sure to thank me later. In case you didn't know, I am a terrible procrastinator. Crafty ideas pop into my head, but I don't always allow enough time to execute them. I always say next year I'll do a better job, yada, yada. Recently, I spotted an idea for a teacher gift on Jill's blog and thought, "Hey, Annelise and I could do that." I liked the fact it was personal while still being simple. We started writing the poem last week (go us), then got stumped on the O phrases. True to form, last night we finished it up with Annelise signing her name approximately 2 minutes before she hopped in bed. Go us. Okay, please don't laugh at the next one. Well, laugh if you must, just keep your mockery to yourself, m'kay? Our printer was on the blink, some doo-hickie fell off and it wouldn't work, so I had to improvise the tags. Yes, they actually say, "Hope you have a Whopper of a summer!" Am I clever or what? 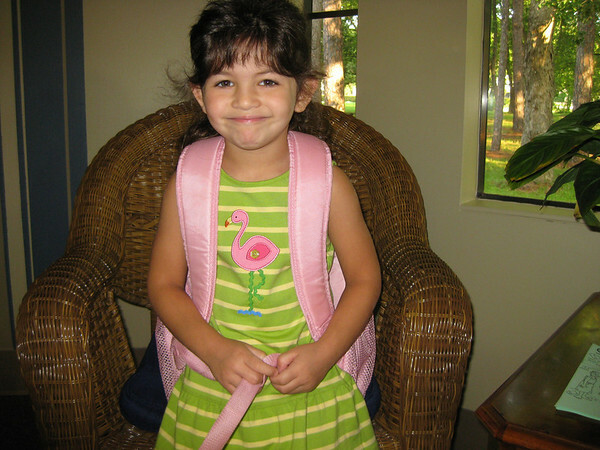 Here is Annelise right before we left for school. 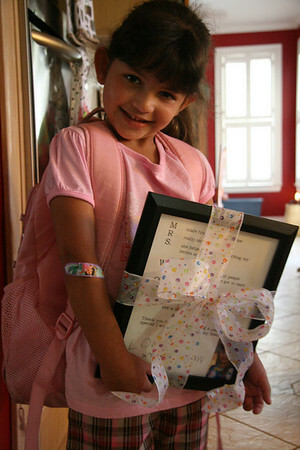 My future Kindergartner. 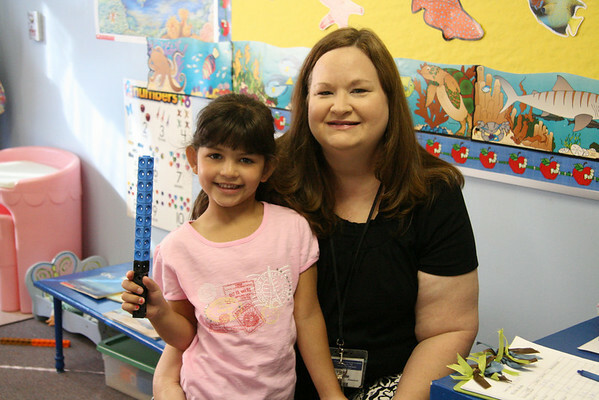 One last picture with her sweet teacher, Mrs. Woods. And yes, that is a light saber that A. made with the connect-a-blocks, her Star Wars obsession runs deep, folks. So...say it with me, what time is it? Summertime! Don't forget to enter my little giveaway!! Darling gifts there with your darling A!! i think your gifts are lovely! my friends call me last minute lucy... so i'm there with you. i love to make valentines and may day baskets, but i always wait til the last minute and it is never as fun as it should be! 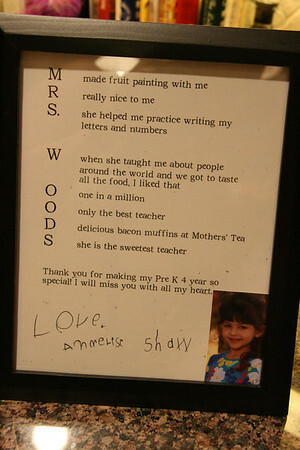 I think that is the SWEETEST teacher gift. I love it!!! It is summertime and the boredom has already started. One day. UGH! I'm going to have to step it up today. It's just around the corner, though...hooray! Thanks y'all! Her teacher seemed to like it. I liked that it was fairly easy to pull together--that's my rule. LOVE the poem! that is just right! Silken: Wow, we better start collecting (too bad we don't have any of the original figures). You know I love that teacher gift idea, I think it's thoughtful and unique. 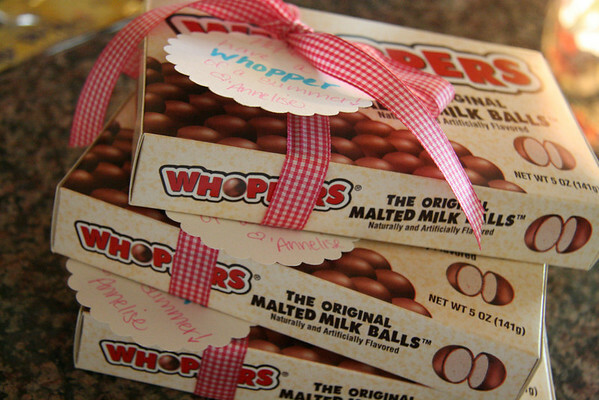 Who wouldn't want a box of Whoppers? Or a real Whopper?